Kiss the rings! 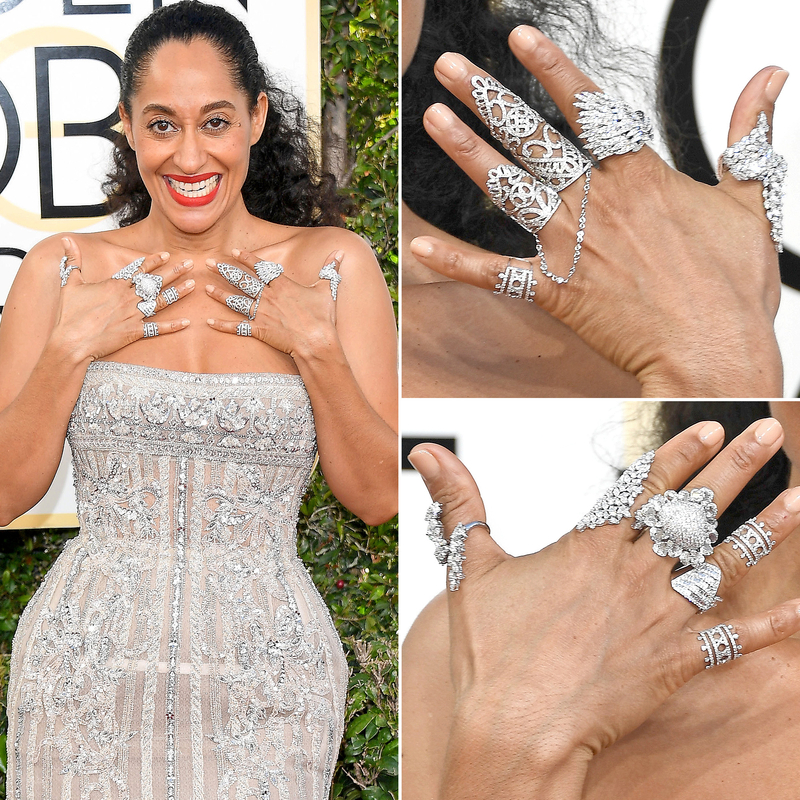 Tracee Ellis Ross and Drew Barrymore piled on the accessories at the 74th annual Golden Globes in Beverly Hills on Sunday, January 8. Ross, who was nominated for Best Performance by an Actress in a Television Series for Black‑ish, glistened in a silver strapless beaded Zuhair Murad mididress and coordinating Christian Louboutin pumps. Sticking to the same color palette, the Girlfriends star, 44, wore diamond rings on all 10 fingers, including baubles from Noudar, L’Dezen by Payal Shah, Hueb, Yeprem and Kavant & Sharart. See her accessories in the video above. Ross deserved to dazzle: She’s the first black woman to win the Golden Globe for Best Actress in a TV Comedy in 34 years. Debbie Allen was the last, for Fame. "This is for all the women, women of color and colorful people whose stories, ideas and thoughts are not always considered worthy and valid and important," she said during her acceptance speech. "But I want you to know that I see you. We see you." Barrymore, who wore a shimmering Monique Lhuillier column with shoulder cutouts to present an award at Sunday’s ceremony, also made a statement with her jewelry. The Santa Clarita Diet star, 41, wore at least seven Harry Winston diamond rings, including a 37.03-carat south sea pearl and diamond bauble and an 11.51-carat emerald-cut diamond rock band set in platinum. At the end of the evening, Barrymore shared a photo of her baubles, making a comparison to Cinderella. "#pumpkin," she captioned.